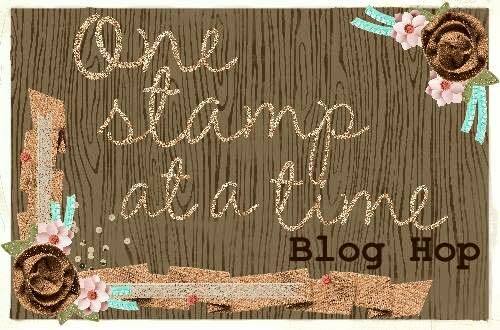 Hello and welcome to One Stamp At A Time's Dog Days of Summer Blog Hop! If you have already been hopping, you should have landed here from the very talented, Lori Mueller's Blog and I would like to thank you for continuing on the hop. If you have started with me, please make sure you hop all the way through as we have some fabulous inspiration for you! If you know me well, you know that I LOVE dogs. So of course, I had to use a dog in my Dog Days of Summer blog post. We recently lost Snickers, one of our Black Labs, to cancer and it was such a tough time for us! We have four dogs left and they come in various colors and sizes. There is Monty, our big brown Great Dane/Golden Retriver mix, Snooki, another Black Lab, Abby our Beagle/Coonhound Mix and Brinkley our little white Jack Russell. When our dogs are outside in the heat of the summer, I can tell you that they will be found under one of our two huge Silver Maple trees. Usually there are at least two together and usually Monty and Snooki (brown and black dogs) are right next to each other. I always tell my husband, Jeff, that they are boyfriend and girlfriend. To make a long story short, this is my take on those two dogs relaxing and surviving the heat of the day together. So for my card I started with a Daffodil Delight 5 1/2" x 8 1/2" piece of cardstock that was scored at 4 1/4". My second layer was a 5 3/8" x 4 1/8" piece of black cardstock. My top layer was Very Vanilla cardstock that measured 5 1/4" x 4". I sponged the sky with Soft Sky Ink, and the sun with Daffodil Delight. My tree was from the awesome new Thoughtful Branches Bundles. It is only available during the month of August unless they bring it back in the next catalog. I absolutely LOVE it! 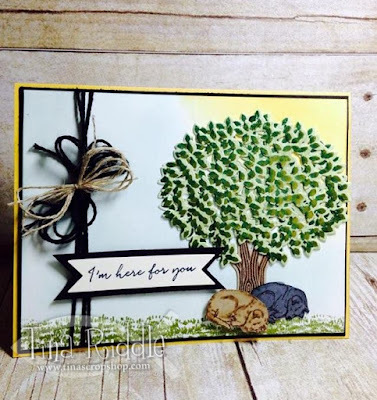 I stamped the tree stamp in Soft Suede onto Crumb Cake cardstock and the top of the tree was stamped in Garden Green onto a background that was created by watercoloring Pear Pizzazz with my Aqua Painter onto Watercolor Paper. I made two tree tops the same way and then offset them a little for more depth. My two dogs were from the Sitting Here stamp set. I stamped one in Soft Suede onto Crumb Cake cardstock, and the second I stamped in Basic Black onto Basic Gray cardstock. I used my blender pens to color them in a bit more and then fussy cut them. 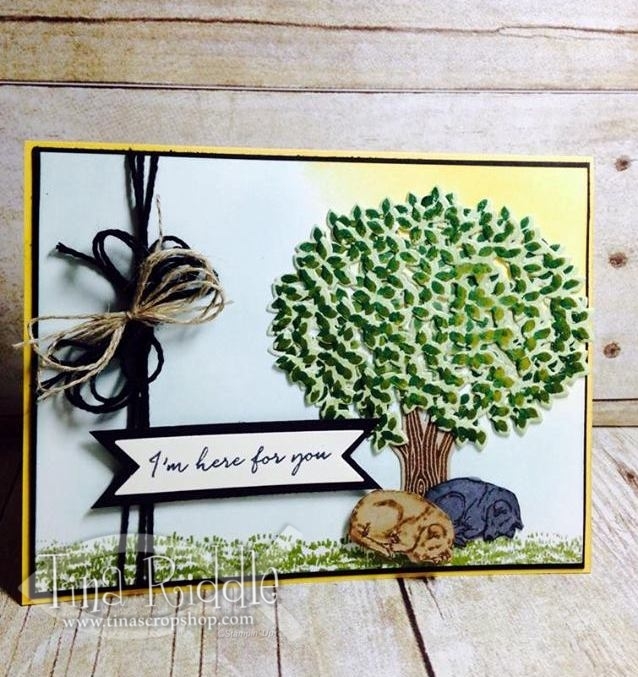 The grass was from the Thoughtful Branches stamp set as well. I stamped it in Old Olive and Pear Pizzazz all across the bottom of my sponged scene. My black dog was adhered with Multipurpose glue over the tree trunk and the brown dog was attached with dimensionals in the front. I added some black twine onto the left side and wrapped around the cardfront three times and then attached a messy black and messy linen bow onto the twine. 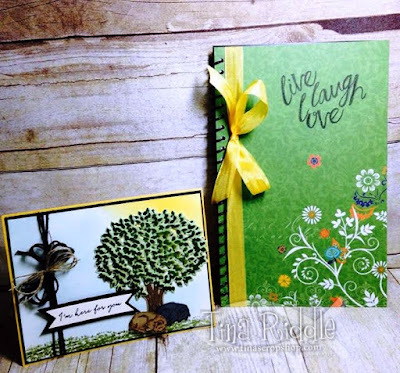 The sentiment is from the Weather Together stamp set. I stamped it with Archival Black Ink onto Very Vanilla cardstock and was backed with Basic Black cardstock and then attached with Dimensionals. For my project, I altered an Address Book that I bought from the Dollar Tree for $1. I unwound the binding and removed both the front and back cover and covered them with Printed Cardstock from the Fiesta Forever Paper Stack. I used Tear Tape to adhere the printed cardstock. I ran some yellow seam binding up the side and stamped the Live Laugh Love sentiment from Layering Love. Next up is the amazing Sara Levin's blog. Just click the Next Button and you'll be there! Here is a list of all of our fabulous bloggers!